Illustration proofs (no. 1443_1444) for the 4th edition of Punch & Judy first published by Lacy and Parker. This work contained the play The Tragical Comedy or Comical Tragedy of Punch and Judy and was illustrated by George Cruikshank 1828. Two etchings printed in black ink on india paper. 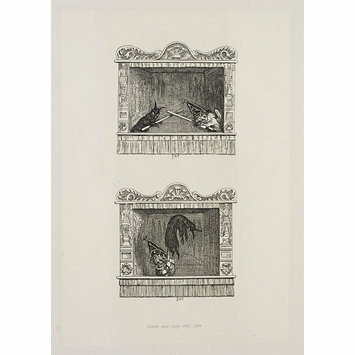 Both etchings depict scenes from a Punch & Judy show performed in a puppet theatre. The top etching sees Punch dueling with the Devil. The illustration below this shows a triumphant Punch using his stick to 'whirl... [the Devil] round in the air, exclaiming, "Huzza! huzza! the Devil's dead!"' (Cruikshank, G. Punch & Judy, 1881, p.94). Illustration proofs (no. 1443_1444) for the 4th edition of The Tragical Comedy, or Comical Tragedy of Punch & Judy with etchings by George Cruikshank first published by Lacy and Parker, ca. 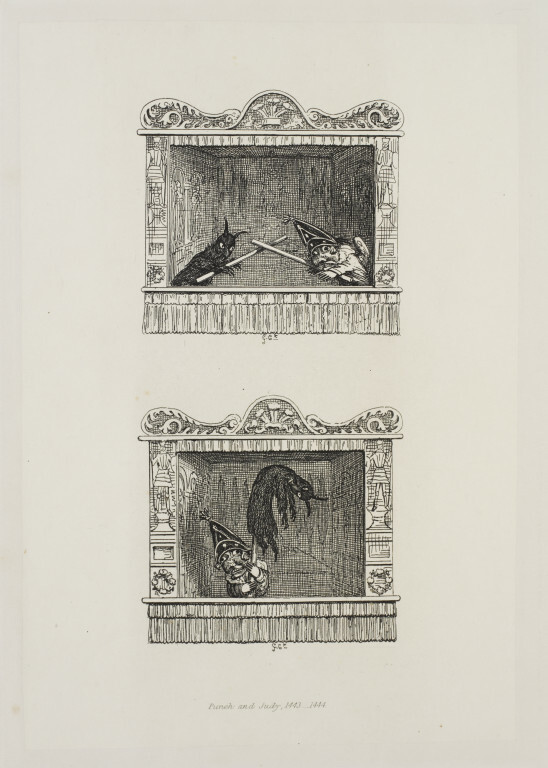 1859, George Speaight Punch & Judy Collection.